Graduates from our Archaeology courses are employed in a range of archaeological projects, both nationally and globally, including those related to proposed mining and construction developments. Private heritage consultant, museum curator, government heritage manager, academic. The Archaeology Program is a world renowned centre of research into the archaeological past. Subjects are directed towards providing an understanding of human societies and cultures based on archaeological, geographical, historical and other evidence. Emphasis is given to the evolution of modern people and their social and technical developments with a focus on both Australia and other parts of the world. In all subjects, attention is given to the techniques and theories that contribute to the study of archaeology. 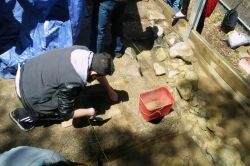 The Masters in Professional Archaeology offers the opportunity to develop workplace skills in archaeological field techniques, technical analysis, Aboriginal and historical archaeology, heritage management and business. Please contact Susan Lawrence for more information. We have a world renowned centre for research in archaeology. We can supervise research topics from deep prehistory to the contemporary world, in any location in the world. Your research will be supported with high quality laboratories and information technology, and skilled technical staff. We provide a number of short courses geared towards building practical skill sets that are useful in the field of archaeology.